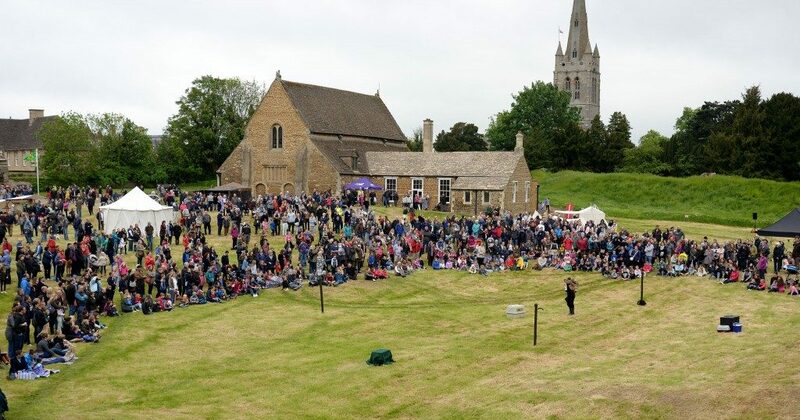 The grounds of Oakham Castle were filled with thousands of visitors on Monday 30th May, as Rutland’s most historic building reopened its doors following a multimillion-pound conservation project, delivered by Woodhead Heritage. The castle has been closed to the public since September 2015 while experts carefully repaired and restored the ancient Great Hall, which dates back more than 800 years to the time of the Norman Conquest. A £2.1million Heritage Lottery Fund grant has conserved the grade I listed building, a scheduled ancient monument, and turned it into a first-class culture and heritage centre – preserving the castle’s key features and adding brand new interactive displays and exhibits for guests to enjoy. Visitors to the site were treated to a day of free events and activities which celebrated the Castle’s Norman roots, including archery, falconry, Norman coin striking, weaving and craft skills. Knights on horseback paraded through the town and there were guided tours to show the results of the restoration work. Prior to the open day, a special ceremony was held in the Great Hall, led by Rutland County Council Chairman Kenneth Bool. The Earl of Gainsborough presented a brand new horseshoe to the Lord of the Manor to mark the reopening, while a special plaque was unveiled to commemorate the involvement of former County Council Leader Roger Begy, who passed away in February. “It has been incredible to watch the transformation of Oakham Castle over the past eight months. The castle has always been extremely important to Oakham but used to be hidden away with little to see or do. Following the restoration, the building has been completely revitalised and we now have all the events and facilities you would expect to find at a top heritage attraction. With the Great Hall restoration now complete, work to reveal, repair and preserve the castle’s historic curtain wall, which is on Historic England’s “at risk” register will continue into August, and includes the completion of a new path and stairway from Burley Road car park. As well as funding repairs to the Great Hall and defensive curtain wall, money from the Heritage Lottery Fund grant will also be used to run an extensive new events programme at the castle, including concerts, dances, living history days, storytelling and drop in activities. A full timetable of events can be obtained from Oakham Castle, Rutland County Museum and local libraries and is also available online.